Teena Leonardi over the years has created bright watercolor silk hangings for homes and resorts, and she has sold her textile designs to fashion designers. She recently teamed up with Kim Kieler of Kim3 International Furnishings to create Art Shades by Leonardi, a line of whimsical silk and linen shades paired with vintage bases dating from 1900 to 1970. With period lamp bases ranging from Art Nouveau, Arts and Crafts, Art Deco, Mid-Century Modern, Eames Era, Hollywood Regency, chalkware and all variety of Retro, Art Shades has caught on with designers and homeowners alike, acting as original art that works for everyday living. “They’re something I hope people have fun with,” says Leonardi. 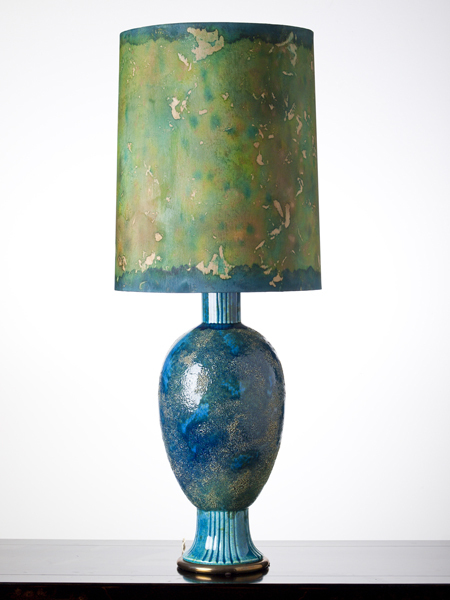 Art Shades unites unique bases with one-of-a-kind lampshades that Leonardi has painted to complement the style of the base. 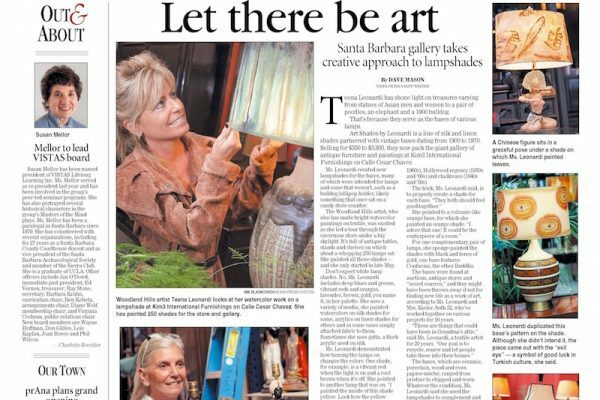 “When designing Art Shades I am inspired by illumination and beauty. For me, it’s a very playful process,” Leonardi says about creating the lights, which end up being conversation pieces. “I am continuously mixing colors to get a shade that matches the base.” Her palette includes deep blues and greens, vibrant reds, electric violets and warm golds, to name a few. Many of the shades change color when the light is turned on. One shade, for example, is a vibrant red when lit and a cool brown when it’s off. Kieler imports fine furniture, antiques and art from Denmark, Sweden, Brazil, France, China, Thailand, Bali, the Philippines, New Zealand, Japan, Vietnam, Cambodia, Laos, India, and Tibet. Like Kieler, Leonardi is an inveterate traveler, and her silk paintings, inspired by her extensive journeys abroad, express her love of natural themes and her spiritual side. Large-scale leaves, lotus flowers and trees, as well as Oriental motifs, painted in water color on large swathes of silk as tall as 20 feet, create a meditative quality that has earned Leonardi a big following in California.